Artprice’s Global Index® shows an average value increase for artworks of +30% since the index was started 20 years ago. Although this is an appreciable performance particularly at a time when central banks’ interest rates are close to zero in the United States (FED) and negative in Europe (ECB), if we focus uniquely on the most stable segment of the market, we find a much more impressive value accretion. Artprice’s new Artprice100® scientific index is subject to IPR protection and represents a major new weapon in Artprice’s commercial arsenal as World Leader in Art Market Information. The objective of Artprice’s new Artprice100® index is to monitor and quantify the art market’s value accretion by focusing on its most stable elements. This new scientific index is a new tool in Artprice’s panoply of proprietary decision-support tools. In effect, the Artprice100® index represents an unavoidable new benchmark in a financial world constantly searching for new investment opportunities in efficient markets. The creation of the Artprice100® index is a response to a recurring demand from Artprice’s financial and banking institution customers, particularly in the Private Banking segment, who need a reliable and durable benchmark that does not require specialist knowledge of the Art Market from its user. With the Artprice100®, the Art Market – universally considered an alternative to traditional financial investments – now has a benchmark comparable to the world’s major stock indices like the S&P 500, the FTSE 100, the CAC 40, the DAX and the NIKKEI 225. It is composed using the same general principles for the construction of these indices: it focuses on the Art Market’s fundamental artists and takes into account their relative weight and importance. The composition of the Artprice100® is adjusted by a scientific committee every 1st January to reflect the evolution of the Art Market. The index essentially identifies the 100 top-performing artists at auction over the previous five years who satisfy a key liquidity criterion (at least ten works of comparable quality sold each year). The weight of each artist is proportional to his/her annual auction turnover over the relevant period. Thus, starting from 1 January 2000 – the Artprice100®’s reference year – an investment is made on the 100 artists whose auction results are the most regular (constant) and the highest (in turnover terms) during the previous five years (i.e. 1995, 1996, 1997, 1998 and 1999). The relative weight of each of the 100 artists is detailed in Appendix 1. The composition of the index does not change during the year. Therefore, the overall value of the Artprice100® evolves according to the individual average performances of each artist in the portfolio, adjusted according to his or her weight within the portfolio. In 2000, the value of the Artprice100® increased by 10.9%. Thus, for an initial investment of $100, the value of this portfolio already reached $110.9 by the end of 2000. The contribution of each artist to this result provides additional information. For example, in 2000, the artist Pablo Picasso had a 16% weighting in the portfolio. During that year, his auction performance contracted by 9%. Therefore, the initial $16 invested in Pablo Picasso (16% of $100) was valued, at 31 December 2000, at $14.6. Fortunately, the portfolio’s diversification helped offset Pablo Picasso’s negative performance in 2000. So, for example, that year saw strong positive performances for Robert Rauschenberg (+59%), Antoni Tapies (+48%), René Magritte (+18%), allowing the Artprice100® index to post a quite remarkable performance for the portfolio as a whole. 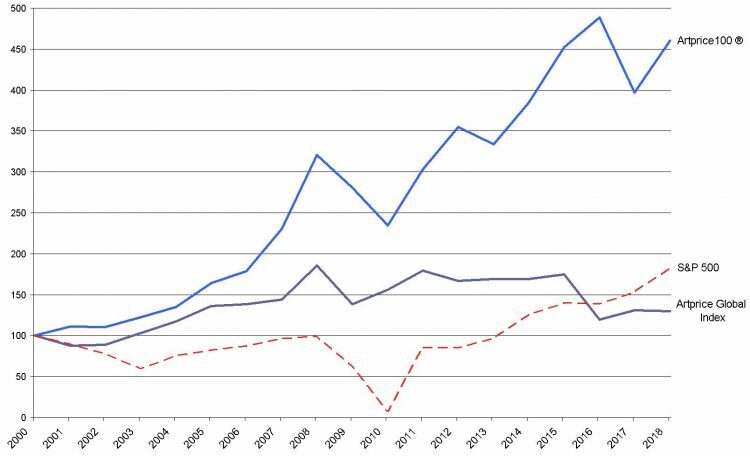 Over the long term, the performance of the Artprice100® largely exceeds that of Artprice’s Global Index and of the US stock market, as represented by the S&P 500. The Artprice100® index provides essential information since its very composition reflects the progressive evolution of the Art market. The artists included each year in the Top 100 are the market’s most important artists, weighted for their average performances over the previous five years. This purely objective criterion allows identification of the most stable segment of the Art Market with a built-in evolution mechanism (annual adjustment). In fact, the new index relies on a huge mass of market information (Artprice’s Big Data) and eliminates possible blind spots that might escape the Index’s Scientific Council by analysing repeat sales and auction results from all over the planet. With its intranet connecting it with more than 6,300 Auction Houses, Artprice is the only organisation in the world that can process this data and produce an index based on a highly complex series of calculations. This gradual transformation of the 100 artists within the Artprice100® is striking over the long term. For example, in 2000, there was only one Chinese artist in this list (Zhang Daqian) compared with 18 in 2017. 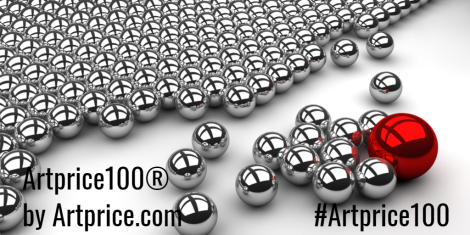 Over 18 years, the Artprice100® grew by 360%, generating an average annual return of 8.9%. This revolutionary approach to investment in the Art Market allows the financial and investment community to apprehend the Art Market via the art of “index management”, a possibility that was hitherto non-existent. This average annual return of 8.9% represents the profitability of the art market’s most stable segment. It proves once again that a relatively well-diversified art portfolio, constructed on the basis of a simple and non-aggressive acquisition strategy, has a genuine economic raison d’être, quite apart from the non-pecuniary benefits of collecting art. Over the last 20 years, the art market has massively increased in liquidity and has grown to now be widely appreciated as a genuinely efficient market to which Artprice – as world leader – has substantially contributed. 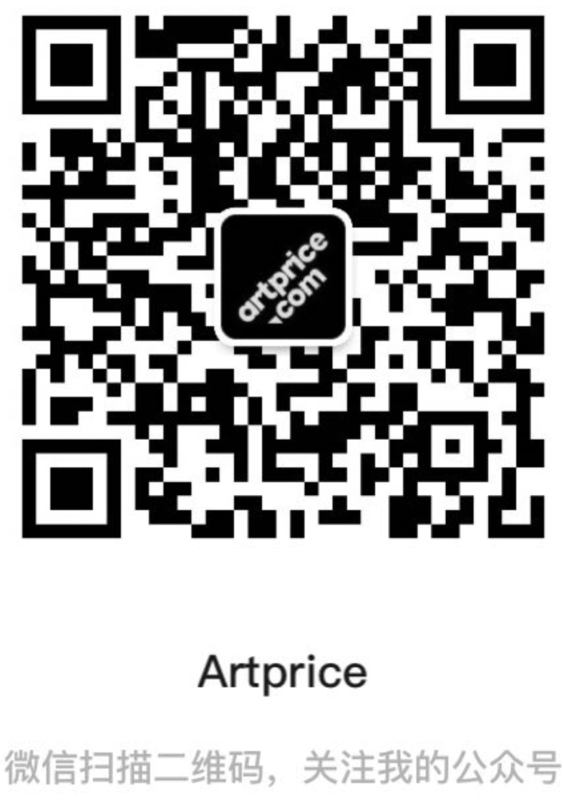 Via its contacts in the financial sphere, Artprice aims to get its Artprice100® index and derivative products rapidly included in the standard financial newsflow packages used in trading rooms around the world.